So, a long holiday weekend can be spent lazing around, traveling, eating too much or doing those things you should have done but haven't. I'm filing this under the last one. While doing some cleaning in the basement, I stumbled upon an unopened package stuck on the shelf. I couldn't remember what I would have ordered that I never opened, particularly as the package was dusty. Well, let's take a look, shall we? Doesn't look like much but I know exactly what this is. It's a mesh screen that goes over a door to keep out flies or other flying insects. I don't remember when I bought this, obviously, but here it was. How hard could this be to install? Not hard at all. It's all velcro. Here's the back door before installation. I don't have a storm door on the back. I used to and, sometimes, I think about how it might be nice to have another, but then the reality of finding a door and getting it installed sinks in. Plus, I finally painted the back door last year and that will go a long way toward keeping it nice. I like my back door. Why cover it up? But, as you can see, if I leave it open so we get a cross-breeze, I get bugs, lots of bugs. 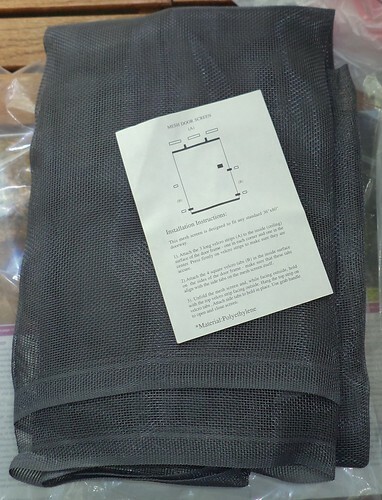 The mesh screen comes with three pieces of velcro to attach the screen to the top of the door frame. There are 4 small square pieces to attach the screen at the sides and at the bottom. The bottom is weighted with what sound like ball bearings. The whole thing is bigger than the door opening. The directions implied that you would put the screen on the inside of the door, but then, if I want to close the door, I have to remove the screen. I opted to put it on the outside. On the left side, you can see a small black "spot". That's a tab that you grab to pull the screen open. I have two small velcro squares on the sides but opted not to attach the bottom. The view outside is not diminished that much. Yes, there is a gap at the bottom and some enterprising fly is going to figure that out. I have the left side attached to the frame but not the right side. I simply lift up the side and enter or exit. Even with an armful of recycling for the can, I get out very easily. This holiday weekend has been warm with a breeze from the southwest. Being able to open the back door and let that breeze into the house has been wonderful. I washed the kitchen floor today and that breeze helped dry it in no time. So why didn't I install this before? I think because I had cats that came and went on their own time. I was outside weeding the pots on the deck and Mija came to the screen to look out. I had to take the screen off half of the door so she could come out onto the deck. These two don't like being outside unless I'm there. I will have to make some kind of tie-back for those days I'm on the deck so they can come and go at will. I have no idea if you can still get these. Tonight, I will pull it down and set it aside for the week. There are rumors of rain and I don't know how this will do in the rain. Down the road, I can see the only expense will be for new velcro, but I'm fairly certain that won't be every year. I am really happy with this. Perhaps I should have done this sooner, but now was the right time.